UPDATE: As of October 31, 2018, this workshop is sold out. We’ll be going again in April of 2020. Discover and photograph a truly unspoiled wilderness of mountains, fjords, glaciers, forests, and steppes. 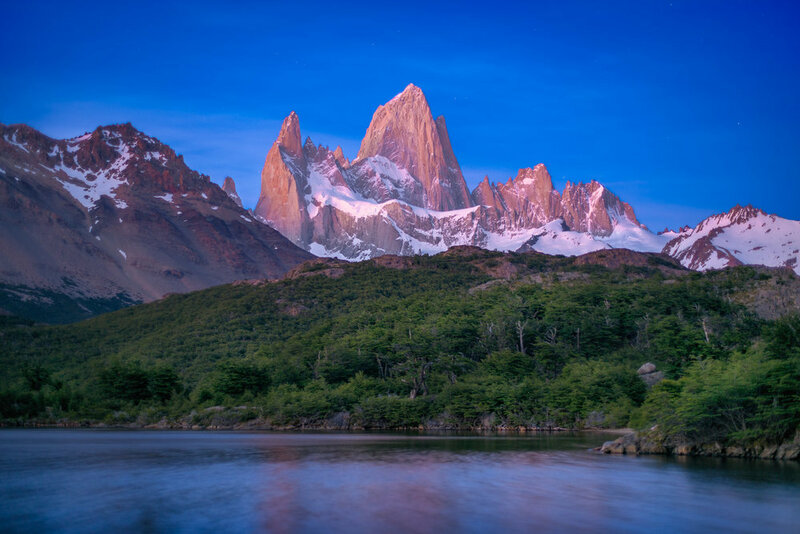 We’ll be visiting both the Argentinian and Chilean sides of this amazing mountain region, with some of the most dramatic mountains in the world towering over glaciated lakes and rolling grassy foothills. This workshop will be lead by Randy Hanna and our amazing local guide Cecilia Costa, who will give you the best local cultural information and photographic guiding. This workshop will give you a feel for the unique alpine environments south of the equator that have remained the same for thousands of years. We’ll be photographing in some of the most dramatic locations within the Los Glaciares and Torres del Paine National Parks. April is the fall season in the southern hemisphere and we have timed this workshop to give you opportunities to photograph the foliage changing to colorful warm hues. Be prepared to get close to the glaciers and walk through rolling foothills, photograph waterfalls, and reflecting lakes surrounded by towering granite spires. You'll be learning from Randy and Cecilia how to improve your landscape photography as well as local geology, flora, and fauna. Randy will be teaching camera techniques such as long exposures, exposure bracketing (both manual and automatic), and using various lenses to photograph creative compositions by stitching multiple exposures together. You’ll have time to work on improving your post processing skills, helping you learn to pre-visulize with the final image in mind. With so many dramatic landscapes, you will be captivated all day—and even during the night—when we get the chance to photograph these amazing mountains bathed in stars! April 3, 2019: Arrive this day in El Calafate, Argentina (FTE airport code). We will meet in Los Alamos Hotel, which is a quick taxi ride from the airport. At 5:00 PM we'll have an introductory meeting and then enjoy dinner together. April 4, 2019: We spend a morning visiting the Perito Moreno Glacier where we will have the opportunity to hike around this amazing glaciated landscape in the morning light. Following, we'll ddrive north to El Chaltén where we'll be staying at the Destino Sur Hotel, for 3 nights so you can unpack and enjoy the spectacular view right from your hotel room. April 5–6, 2019: These days in El Chaltén offer a great opportunity to explore the northern area of Los Glaciares National Park, where Mt. Fitz Roy and Cerro Torre are located. April is when the fall season is in full swing, and the foliage offers a warm palette of colors. Hiking towards the base camps offers unique opportunities for photographing the best shots of the mountains and the forest at down and sunset. April 7, 2019: We drive to El Calafate along the scenic highway with a stop at a working horse ranch where we'll partake in a authentic Argentinian BBQ, followed by a photo shoot with the gauchos riding horses in the beautiful landscape, in the fields, and at the barns for portraits. We take the scenic drive south to El Calafate in the afternoon, and photograph the landscapes along the lake at sunset. Our hotel for this night will be Los Alamos. April 8–11, 2019: We drive into Chile where we'll spend time in the Torres del Paine National Park. We'll be staying at the Hotel Rio Serrano, where we can unpack and enjoy more amazing views from our rooms. We'll be spending these days exploring the surrounding locations during the best light, and taking guided hikes into more remote regions for different views of the glaciers and mountains. The daily itinerary will be determined by your leaders based on weather and conditions. April 12, 2019: Following sunrise and breakfast we’ll drive a few hours to Puerto Natales, where we will be treated with a quaint artisanal fishing port, giving us a bit of diversity after all the glaciers, lakes and mountains. April 13, 2019: Following sunrise and breakfast we’ll move to Punta Arenas for our final night and dinner together. April 14, 2019: Departing flights can be booked anytime, airport shuttle available. Air transportation to El Calafate, Argentina and from Punta Arenas, Chile. Alcoholic beverages. Visa or passport fees. Items of a personal nature. Medical Evacuation Insurance (required). Travel Medical and Trip Cancellation Insurance (optional, but recommended). Items of a personal nature. Anything specifically not mentioned as included. Your deposit of $3,000 will hold your space in this workshop. A second payment of $4,000 will be due on September 1, 2018. The balance of $4,500 will be due not later than January 1, 2019. All of our standard terms and conditions apply. Need special payment arrangements for your deposit? No problem, just ask us. Patgonia is simply amazing. For a great small group photo experience at the best time of year, click the “Sign Me Up!” button, and we‘ll see you in Patagonia! Got questions?